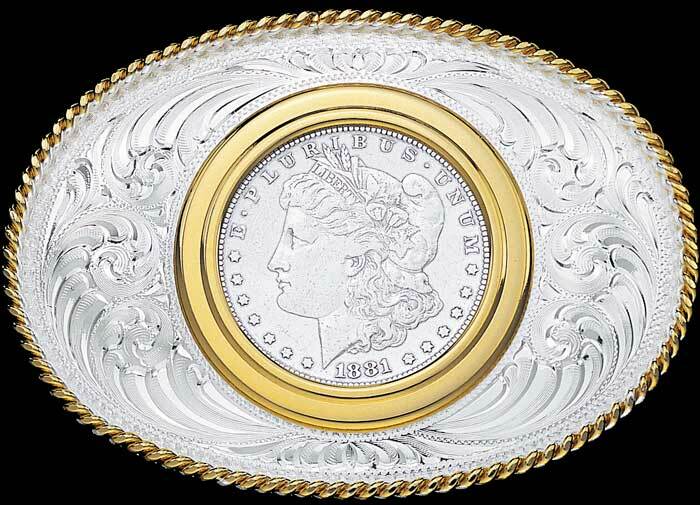 Morgan Silver Dollar Belt Buckle by Montana Silversmiths. Includes a genuine Morgan Silver Dollar — date varies, up to 100 or more years old. Tarnish-proof and durable silver and gold electroplate finish. Lifetime guarantee. Also available without the silver dollar (add your own) for $73.99. 2½" high x 3½" wide. Click either image to enlarge. The electroplate finish of Montana Silversmiths products -- including this Morgan Silver Dollar Belt Buckle -- simply won't tarnish. All Montana Silversmiths western belt buckles have a lifetime guarantee against defects and workmanship. They are die-struck from hand engraved masters, finished with silver and gold electroplate and state-of-the-art Montana Armor® tarnish protection.